Miami, located in the United States south, has become a premium destination for travelers all over the world who want to experience the city's exhilarating nightlife and cultural diversity. Travelers who want to stay in some of the area's hippest hotels should try to book reservations at the following establishments. 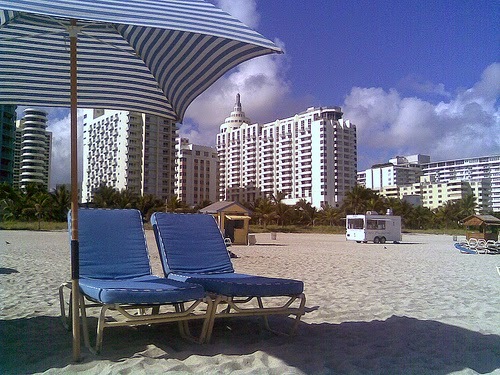 Fontainebleau Miami Beach has been one of the hottest hotels in Miami since it opened in 1954. To keep up with contemporary aesthetics, the owners spent $1 billion renovating the hotel in 2008. Since then, it has won several awards from design and architectural organizations. Renewing itself in this way helps Fontainebleau stay at the top of Miami's list of trendy hotels. The hotel offers excellent services and accommodations, too, such as a kid's camp that keeps the children entertained while the adults relax on the beach. Travelers can learn more about the Fontainebleau and other Miami hotels by doing some brief Internet research. It's an easy way to compare Miami's top hotels to get a great room at an affordable price. SLS Hotel South Beach has the perfect location for travelers who want a taste of Miami's nightlife. The hotel gets guests into the South Beach spirit by introducing them to some of the area's trendiest restaurants and bars. Foodies will want to make reservations at The Bazaar by Jose Andrews. Those who prefer drinks and dancing can venture to Hyde Beach, a club with indoor and outdoor spaces, a pool, and direct access to the beach. Travelers who don't stay at SLS Hotel South Beach should at least consider visiting one of the restaurants or bars. Anyone researching trendy hotels in Miami will eventually learn about Epic Hotel. The hotel often gets attention because it is epically huge. At 54 stories, the building dominates a small part of the Miami skyline. Travelers could enjoy their entire vacations at W South Beach. The hotel offers such a diverse menu of services and attractions that practically anyone will find it impressive. Art lovers will want to visit the hotel's extensive collection of works by contemporary artists. Guests who love gourmet food will want to book reservations at one of the hotel's two flagship restaurants. Mr. Chow serves haute Chinese cuisine while The Dutch serves New American cuisine. One of the hotels most unique, and therefore trendy, features is an outdoor labyrinth of lilies and sea grape trees. Guests will also find extraordinary features in their rooms, such as showers made of Cippolini marble and a fully stocked kitchen. Miami is a trendy city with a lot of popular hotels. Have you ever stayed in one of these trendy locations? What did you like most, or least, about your experience?